It would cost the state of California an estimated $400 billion per year to cover all of its 39 million residents, according to a staff analysis by the state's Senate Appropriation Committee. That's more than twice the state's total annual budget of $180 billion. 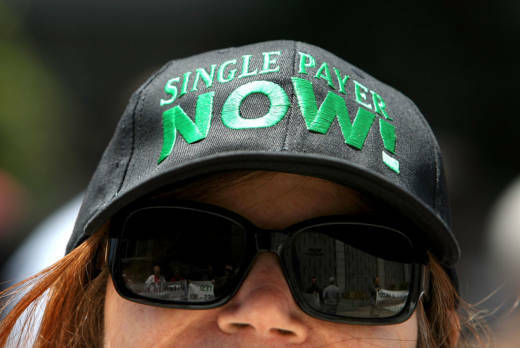 But the main legislative advocate for single-payer, Senator Ricardo Lara (D-Bell Gardens), explained the state could get access to half of that amount, $200 billion, by shifting over what it already spends on Medicare, Medi-Cal and other state-run health services. That assumes the federal government would agree to let California re-route federal funds in that way. "The fiscal estimates are subject to enormous uncertainty," said Nick Louizos, vice president of legislative affairs for the California Association of Health Plans. "If a combination of assumptions don't come through, this could be even more expensive than we even think." To raise the other $200 billion, the state could implement a 15 percent payroll tax, according to the analysis, which was released Monday during a Senate Appropriations Committee in Sacramento. It's unclear how that tax might be split between the employer and the employee. "Given this picture of increasing costs, health care inefficiency, and the uncertainty created by Republicans in Congress, it is critical that California chart our own path," said Lara at the committee hearing. "It will eliminate the need for insurance companies and their administrative costs and profits," he added. "Doctors and hospitals will no longer need to negotiate rates and deals with insurance companies to seek reimbursement." At the hearing, Kyle Thayer, a paramedic who works in San Diego, urged the legislators to move forward with the plan. “I see every single day the people that don’t have health coverage and the things that happen. Often they choose between one medicine and another, and end up in the back of my ambulance for something as simple as high-blood pressure medication," said Thayer, a resident of Carlsbad. His concerns were personal as well as professional, he said. Opponents of the plan also spoke, including Karen Sarkissian from the California Chamber of Commerce, who called the 15 percent payroll tax a "job killer," and a line of representatives from private health insurance companies. These companies would see their business model collapse in California in the face of a single-payer plan, which would be state-administered and not-for-profit. “We don’t need to go backwards and start from scratch. This bill could have catastrophic implications for the health care system in our state,” said Teresa Stark, the chief lobbyist for Kaiser Permanente in California, which covers 8.5 million Californians. "We share the goal of health care for all," she explained, but added that a single-payer system would "dismantle Kaiser Permanente as we know it."